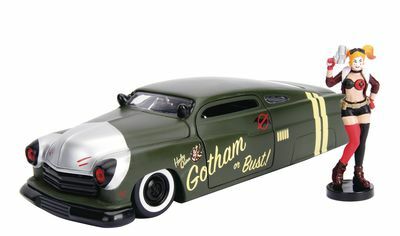 Collect the DC Bombshells in a whole new way with Jada Toys' 1/24-scale die-cast vehicles that come with a matching figure! The vehicle features opening doors, hood and trunk, along with a detailed interior, while the matching figure stands 2 3/4" tall. Choose from a 1951 Mercury with Harley Quinn, a 1952 Chevy Coe with Wonder Woman, a 1953 Chevy Bel Air with Poison Ivy, and 1956 Cadillac with Catwoman, at 1956 Ford F-100 with Supergirl, or a 1957 Chevy Corvette with Batgirl. Window box packaging with a display backdrop. Legal Notice: Entire contents trademarked (® or TM) and copyrighted (©) 1986-2019 by Things From Another World, Inc. and respective copyright and trademark holders. All rights reserved. Page rendered at 2019-04-19 08:03:57 in 0.267 seconds.